CREP stands for Conservation Reserve Enhancement Program. Similar to the Conservation Reserve Program (CRP) it is a voluntary land retirement program designed to protect environmentally sensitive land, decrease erosion, restore wildlife habitat, and safeguard ground and surface water. The enhancement comes in part from the additional cost-share and incentive payments provided by state and private conservation organizations. It also reflects a greater level of commitment to removing pollutants from our waterways. CREP's emphasis is on solving problems in environmentally sensitive areas, primarily resulting from agricultrual run-off and stream-bank erosion. With funding and expertise from several sources, CREP provides farmers, producers, and ranchers with a solid finanacial package for conserving and enhancing our natural resouces. Many CREP programs consist of planting buffer strips between waterways and pollution sources, such as cow pastures and crop fields. For more information go to: http://www.fsa.usda.gov. Riparian buffers are one method CREP uses to prevent pollutants from reaching streams. The consist of plantings of trees, shrubs, and grasses that catch pollutants in both surface runoff and ground water before those pollutants reach a body of water, such as a stream or lake. Trees provide significantly more and better filtration of pollutants than do grasses. Tree root depth and mass are significantly greater than the roots of grasses covering the same area. Moreover, the leaf surface area of trees is orders of magnitude greater than the leaf surface area of grasses in the same area. That means that much more water and other compounds are respired at a much greater rate. Trees also provide shade necessary to keep water temperatures within normal ranges. The decline in trout populations is directly related to elevated stream temperatures, which often results from removal of trees to provide pasture land. In addition, some grasses actually thrive under tree canopies, thus providing the best of both worlds. 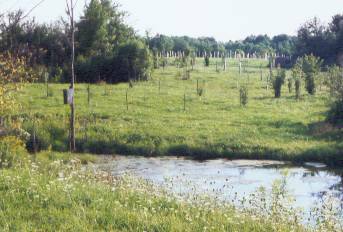 On the whole, planting trees provides exceptional benefits to CREP landowners, farmers, producers and ranchers. But once trees are planted, it's crucial that they be protected. There's nothing worse than having to do the same job twice, which is exactly what happens when trees go unprotected.